Aeration systems for conventional wastewater activated sludge plants typically account for 45 to 60% of a treatment facility’s total energy use. The ability to define what improvements will be most cost effective begins with understanding how to create a simplified model of the system. The equipment used for wastewater aeration is required for the biological process and also to provide mixing to keep solids suspended for more effective treatment. 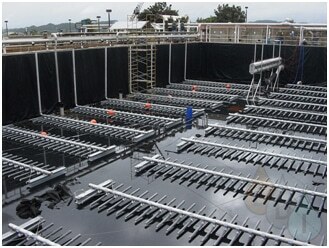 Although there are many types of aeration systems, the two basic methods of aerating wastewater are through mechanical surface aeration to entrain air into the wastewater by agitation, or by introducing air or pure oxygen with submerged diffusers. The surface aeration is very energy intensive and almost obsolete nowadays. Diffused aeration systems include a low pressure, high volume air compressor (blower), air piping system, and diffusers that break the air into bubbles as they are dispersed through the aeration tank. The most commonly used blowers are positive displacement type blowers, and centrifugal blowers (single and multi-stage). An air diffuser or sparger diffuser is an aeration device typically is used to transfer air and with that oxygen into sewage or industrial wastewater or alternatively for mixing the large volumes. Oxygen is required by microorganisms/bacteria residents in the water to break down the pollutants. Diffusers/Spargers use either rubber membranes or plastic/ceramic elements typically and produce either fine or coarse bubbles. 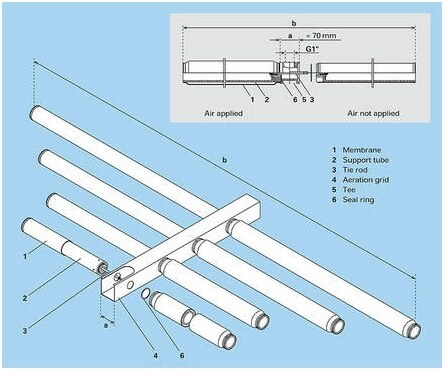 Diffusers are typically connected to a piping system which is supplied with pressurized air by a blower. 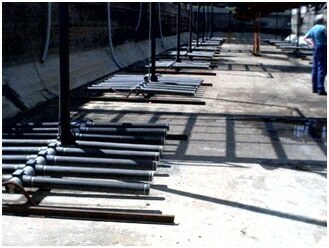 This system is commonly referred to as a diffused aeration system or aeration grid. There are two main types of diffused aeration systems, retrievable and fixed grid, that are designed to serve different purposes. In the case of a plant with a single tank, a retrievable system is desirable, in order to avoid stopping operation of the plant when maintenance is required on the aeration system. Fixed systems are typically less costly, and often more efficient because it is easier to make full use of the floor. Fixed systems can be used in multiple tanks. The two main types of diffusers are porous & non-porous fixed orifice diffusers. The porous diffusers have types like Disc, plate or membrane (Fine Bubble). The non-porous diffusers are perforated piping, spargers & slotted tube (Course Bubble). Diffuser Performance: The efficiency of Oxygen Transfer depends on many factors like type, size and shape of the diffuser, air flow rate, depth of submersion, tank geometry etc. 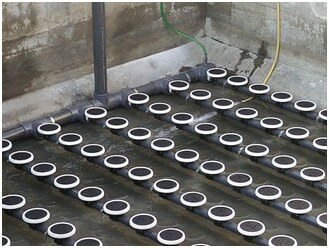 When facilities are interested in improving aeration system efficiency to reduce energy costs, the first thought is typically “fine bubble aeration.” While this is an excellent way to improve the oxygen transfer efficiency for some aeration systems, many other considerations should be reviewed to understand how each part of the aeration process impacts energy use and the effect it may have on other facility processes. Apparently it looks like that Fine Bubble systems are more energy efficient. Without a comprehensive model of the aeration system, energy savings calculations comparing course with fine bubble aeration systems are often skewed by not including the increased back pressure that occurs in fine bubble systems. The presence of constituents like detergents, dissolved solids and suspended solids affect the bubble size & shape & diminish Oxygen transfer efficiency.